Jaevon McQuitty announced his commitment to the Huskers the morning of their junior day on March 12, 2016. 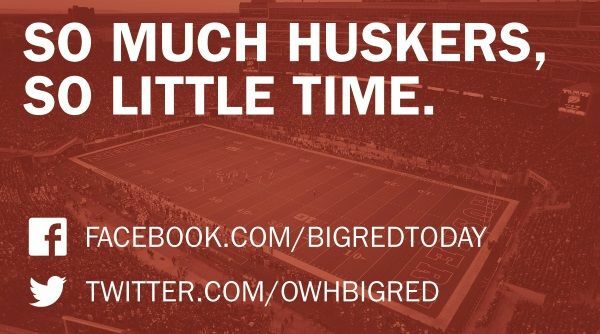 The 6-foot-2, 190-pound receiver posted a tweet saying Nebraska is where he felt at home and where "his heart is telling (him) to go." McQuitty had made visits to Lincoln before, and he seemingly had his mind made up upon arrival for junior day. McQuitty had attended the spring game the previous year, receiving his scholarship offer from the Huskers — and his first offer overall — at that time. He later visited again for NU's 2015 season opener against BYU. McQuitty, the second player to commit — joining linebacker Willie Hampton — and first receiver, is close friends with fellow 2017 recruits Darnay Holmes and Keyshawn Johnson Jr. (a Husker commit), both of whom hail from Calabasas (Calif.) High and were also in attendance for 2016 junior day. Johnson followed McQuitty and committed less than a month later. As a junior at Columbia (Mo.) Battle High, McQuitty racked up over 50 catches and over 1,000 yards, scoring 12 touchdowns. He has also returned punts for the Spartans, who finished 11-3 in 2015, falling in the Missouri Class 5 state semifinals. Class 5 is Missouri's second largest of six high school classifications. Review of McQuitty's tape shows a player who is quick out of his break, explosive after the catch, has good top end speed and can make catches in traffic. McQuitty's role now shifts to recruiter, as he's been vocal in enticing other recruits to join him in the class. He took his official visit to Nebraska for the Illinois game on Oct. 1, when he was on campus with several other highly-rated recruits. Offensive coordinator Danny Langsdorf made an in-home visit with McQuitty on Nov. 28. McQuitty is a three-star prospect according to 247Sports and a four-star by Rivals, Scout and ESPN. McQuitty had offers from Illinois, Indiana, Iowa, Maryland, Michigan, Minnesota and his homestate Missouri, among others. Former Husker receivers coach Ted Gilmore, now at Wisconsin, was also showing interest in McQuitty. McQuitty posted a SPARQ score of 72.66 at The Opening Regional in Chicago in May. That included a 4.7-second 40-yard dash, 4.39-second 20-yard shuttle, 30-foot kneeling powerball toss and 28.1-inch vertical jump. Looking to enroll early, McQuitty announced Dec. 20 on social media that he had graduated from Battle and was looking forward to moving to campus soon. "I'm about to sign my papers and financial aid here soon," McQuitty said on Periscope. "I'm ready to get on campus though, for real. I'm excited."